Flick, Dot and Buzz are busy cats who are out and about around the internet, and with the help of our human, we want to share the awesomeness of the internet with other cats and cat-people. We want to share information about cat causes like cat-food-safety and having decalwing banned in Canada, and other kinds of cat-causes. We post links to cat resources and information on the intenet, and write articles about (and interviews with) interesting cats, and fun stuff too - cat toys and nip and such. What's NEW in our website? This year we have been busy with our ongoing project of Pet Food Safety advocacy work... and in our spare time, patrolling our balcony, and managing our cat nip crop. Plus, frightening mice at night. 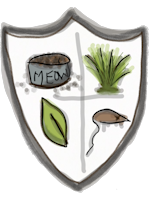 Recently our human made us a crest to thank us for our work in deterring mice. Next to Boxing Day, Earth Day is our favorite holiday. After all, earth is our home, where everything we know and care about lives, and until we've proven that mice live on other planets, it's where we'll stay. Please join us for a 'Paws for Earth' special earth day celebration (and challenge). 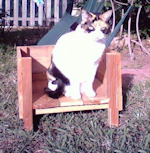 Hi Cats, we've been busy reading and we've decided to become pet food safety advocates. Don't worry, we're all safe and healthy, but there's lots of frightening things going on in the pet food industry. The more we've learned, the more concerned we have become. We joined the Association for Truth in Pet Food http://associationfortruthinpetfood.com/ and we continue to support this cause with funds raised by running ads in this website - you can support our work by clicking on ads that interest you! Happy Holidays! Cat-friendly paper Chrismas Ornaments you can make. Kid-friendly, cat-friendly, environmentally friendly... and presented here free with complete instructions too! Read more about Cat Friendly Christmas Ornaments - and if you enjoy those, check out more DIY Cat Toys too! Our local hero cat, Fritz the Cinema Cat of Salt Spring Island. Fritz is possibly the most famous feline who's ever lived on the island, if not throughout the entire Gulf Islands. From our point of view, he's certainly more famous than some of the local human residents, but humans might feel otherwise. He was certainly very widely admired and highly regarded by his community. An interview with a contemporary artist who's work we admire, Henry the Feline Fiber Artist, who's claw-work creates the fabulous 3D abstract fiber art sculptures on display at his local public library. Some people; often ones who describe themselves as 'dog people' think that cats are uncommunicative creatures. They would be exactly wrong! Cats communicate in all sorts of ways. Our most obvious signalling device is our tail, so we'll start with that. 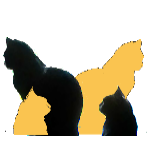 You can read all about TAIL TALK and look for future articles about other means of feline communication. Earl Grey for Prime Minister! http://tuxedostan.com/ Because neglect isn't working! CDART volunteers respond in times of disaster and emergencies when domestic animals are in need of rescue and sheltering. Volunteers are mobilized when local authorities request CDART's help and when the Provincial Emergency Program's Emergency Social Services is activated. CDART is 100% volunteer based and 100% of their funding comes from donations. You can sent us a miow, mew, mrouu, prrrtt, puurrrrr or message at e-meow@flickdotbuzz.com and ask us about being awesome (or make a suggestion for our website, or just send us an e-purrr). Thanks for visiting *paw waives* stop back soon for more new articles, cat photos and links to great cat-content that you won't want to miss! Purrrs to you all.